Millions of people suffer from gastrointestinal disorders, one of the most prominent being Irritable Bowel Syndrome, or IBS for short. Women are the most affected and experience uncomfortable symptoms such as abdominal cramping, diarrhea and constipation. The best course of treatment for IBS are dietary and lifestyle changes, and a low FODMAP diet can be greatly beneficial in reducing or even irradicating symptoms. High FODMAPs should be avoided in people who suffer with gastrointestinal issues. Studies have shown that a low FODMAP diet may help alleviate the symptoms of irritable bowel syndrome in both adults and in children. As with other strict diets, the low FODMAP diet may be difficult to follow, as many foods are on the list of high FODMAPs, and therefore should be avoided or reduced. Low FODMAP foods, however, are welcomed into the diet of people suffering from gastrointestinal issues. Here are some foods that are low in FODMAPs, however, some still need to be eaten with caution. 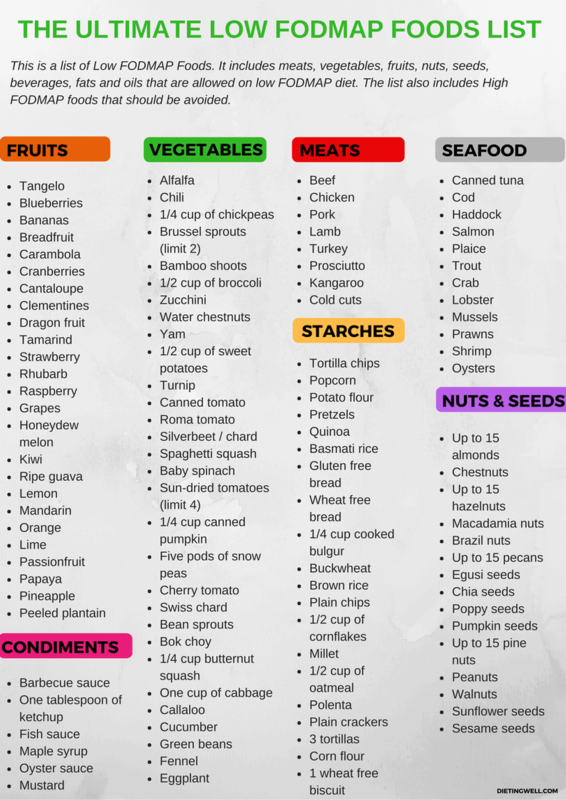 While this list of foods may seem daunting, there are many recipes that are healthy and delicious for those who are on a low FODMAP eating plan. For example, an egg florentine with spinach, bacon, eggs, and a lemon hollandaise sauce. The key to being successful in eating a low FODMAP diet is to make a list of the foods and recipes you love and substitute out ingredients as needed. Processed foods and meats can be full of irritant FODMAPs. They are full of hidden sugars (think high fructose corn syrup) as well as irritants like garlic and onion. These are even present in seemingly innocuous things, like chicken bullion, so beware. Alcohol is a major aggravator, so limit your intake. If you wish to drink, do so in moderation and stay away from beer, which is high in indigestible carbohydrates. Clear spirits such as vodka and gin with water are your best bets, and can be flavored with suitable fresh fruit. Enjoy your food. Take the time to savor each bite, and chew your food well. This will give your body a chance to process it more efficiently, and your brain will have an opportunity to let you know when you are full, thus reducing your chance of overeating. Drink plenty of water! Water is vital to every organ in your body, and aids in healthy digestion. Drinking a glass half an hour prior to a meal will also help you to not over-eat. By following these tips and expanding your knowledge about FODMAPs, you will be able to reduce your symptoms and begin creating tasty, pain-free recipes of your own. I hope you enjoy these recipes as much as I enjoyed writing them for you, and that they give you a well-rounded idea of just how non-restrictive, yet delicious eating this way can be! On fodmap diet, was told not to eat processed meats. Does this include deli meats like roast beef, corned beef or off the bone ham ?? Wheat Free pasta – then several items lower it says: “Brown and white rice, and Wheat pasta”. Is it true Brown and white rice and Wheat pasta are “OK”? Awesome! This Low FODMAP Food List is just what I was looking for. I’ve just started on the low FODMAP diet and it had really been a challenge finding fodmap food list items worth checking. Thanks for sharing this!